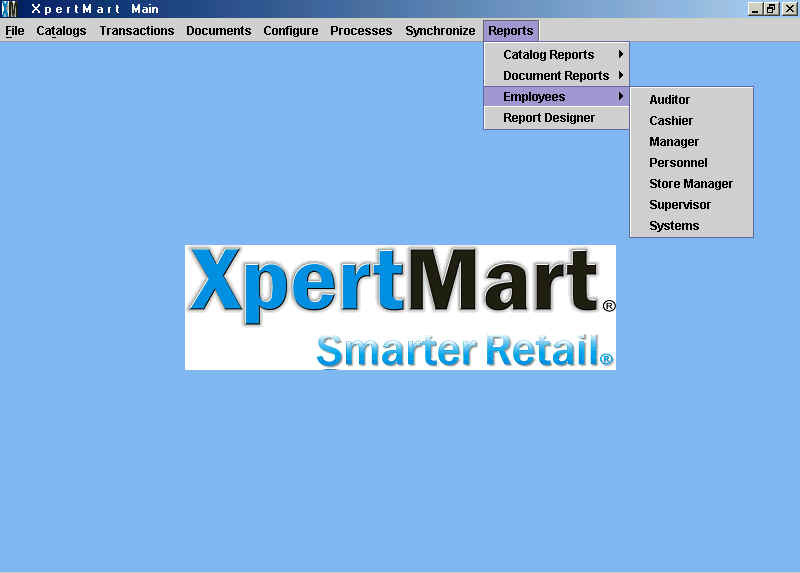 XpertMartTM currently has a library of 220 reports. Each user can choose as many of these reports as they like. We can load the entire library into each installed version of XpertMartTM or only those which the customer deems necessary. We can also customize how these reports are stored and accessed. Every catalogue in the system (Styles, Colors, Vendors, Customers, etc.) includes a Reports button in the tool bar which opens a menu of only those reports pertaining to that catalogue. If I am in the Vendors catalogue and press the Reports button, a menu of Vendor-specific reports will appear. Reports can also be stored in a directory by employee type. This way, for example, the Cashier can quickly open a menu of reports that are relevant to her such as the Payments Journal, the Daily Z-Out, the Credit Card Journal, and so on. So even though there are more than 200 reports in the system, the Cashier only has to deal with a menu of 10 reports. Multiple copies of the same report can be saved in a variety of menu options, as in the image shown below. For example, a report on the 10 best-selling brands can be saved in the Brands Catalogue, the Styles Catalogue, as well as in under the Store Manager menu. This way, the report can be accessed from different locations. In addition to the library of pre-designed reports, we offer the customized design of 30 reports as part of our Training & Tech Support contract. We'll take any idea you have for a report--an Excel sheet you are used to using or the jottings on a napkin--and design an XpertMartTM report you can use in 2 days. Because data is stored in an open, relational database, we can literally design a report around any combination of data a customer can conceive. Because we glean the best reports that customers have asked us to design for them, our library of reports is growing by about 10 - 15 reports a month. Since all XpertMartTM customers with current Tech Support contracts have access to the reports library, the analytical power at their disposal increases every month--keeping their investment in software relevant. Finally, all of our customers receive 9 hours of training in the XpertReports design module so that they are not dependent on us to create or modigy their own reports. Reports can be designed centrally and polled out to the stores, giving you greater control over the flow of information. For example, you can design a report called "Tuesday", save it in the Store Manger directory, poll it out to the stores, and ask every store manager to run that report every Tuesday. We have included images from some sample reports to illustrate the types of reports at the disposal of XpertMartTM customers. Click on the link to the left that most interests you.